The Winter season saw a record 28 divisional champions crowned and a significant number of last-second scores and stops to secure victory. Top seeds were routinely eliminated as underdogs came out on top time and time again. The past season also saw record numbers of female and high-school athletes participating. The talent pool in Manitoba is very deep and that talent was put on display in abundance this season and over championship weekend. 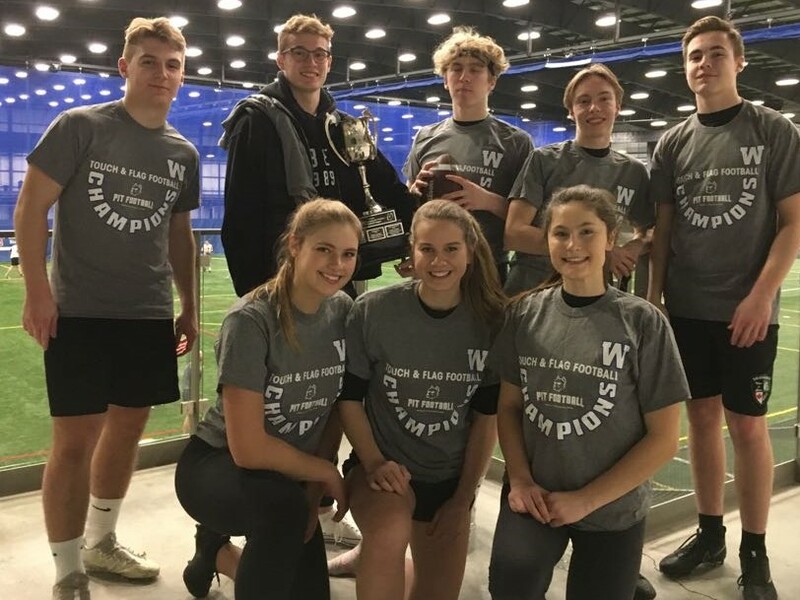 Jackson Tachinski set the Wining High School Flag Football Division 1 touchdown-pass record with 27, and kept up his torrid pace by throwing for six more in the Vincent Massey victory. 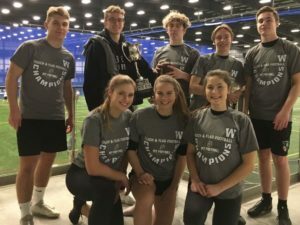 With the win, Vincent Massey three-peats as WHSFL Division 1 Flag football champions, a testament to the football program this school is building. The top two high school teams this year both came out of Vincent Massey, however the other high school programs took a big leap forward as St. John’s, Sisler and Steinbach also had Division 1 caliber programs. Check out a few highlights here to see just how deep the talent pool is in the WHSFL division! 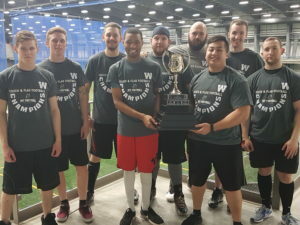 The WHSFL Division 2 flag football championship came down to the wire, with Grant Park earning their first title by narrowly edging out Garden City. Game MVP Wyatt Barber threw for two touchdowns including the game winner to Marco Chagas. Garden City started the season 0-3 but righted the ship at the midway point of the season and almost pulled off the upset victory, if not for Alex Minor’s interception that put an end to the comeback bid. While they may not have won, the one-handed catch that punched Garden City’s ticket to the final was one for the ages. 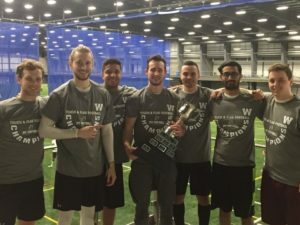 The Connor McDavids finished the season undefeated after a wild coed game that saw the McDavids score the winner with just eight seconds remaining. Jessica Smilar, the coed division’s second-leading scorer, ran a perfect goal line out route for the score after her team had been stopped at the goal line on both first and second down. Joey’s Old Wood had one last chance for a Hail Mary at the end of the game, but the ball landed just out of the reach of the intended receiver or this game easily could have gone to overtime. A thrilling end to a thrilling season of coed which saw a record number of teams and female players participate! Sportsmanship was the name of the game as rookie team #Dumbthicc took out the veteran Dillos South team by just a convert in a contest that came down to the final play. Dillos South was led by the 12 points of Jason Cassie, who just a week earlier set the all-time single-game scoring record when he scored a remarkable 49 points. Taylor Reynolds scored the winning convert while adding eight points and an interception for #Dumbthicc. 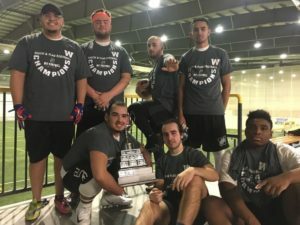 It was quite the night for the Vincent Massey football program as the #Dumbthicc team added to the hardware the school took home. 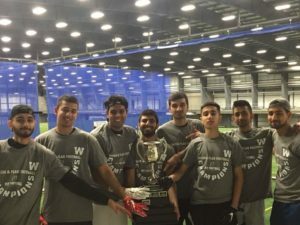 The Guild won back-to-back indoor titles after defeating the Knights in one of the highest scoring games of the night. U of M Bison standout receiver Shai Ross had 13 points while stretching the defence deep all night, whereas Marc Steeves contributed 14 points working the underneath routes. The Knights were led by the five touchdown passes from Jim Bell, who was recently inducted into the Manitoba Touch Football Hall of Fame. His pinpoint accuracy was definitely on display in the championship game. Another great game in the legendary Guild/Knights rivalry. 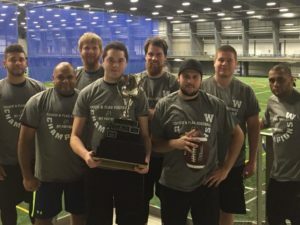 The Horde had a chance to win this game from the five-yard line on the final play of the game, however the Beerhawks defence came up big to force overtime. Both teams hit their first two converts, but the Beerhawks failed to capitalize on their third. Nick Trinder ran a textbook out-in-out pattern on the goal line, then made a diving catch that had to be reviewed before the touchdown signal went up! 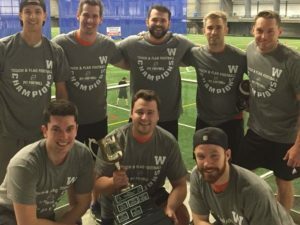 With that the Horde win their first title in two years in what may have been the most entertaining game of championship weekend. 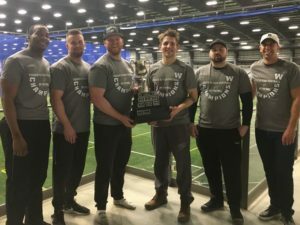 The University of Manitoba Bisons entered the Herd into the PIT Football league to gain some extra reps, and while they were very raw to start, these tackle players picked up the touch football game quickly. In the Division 3 final, they showed up with only four healthy players and one player who just had double knee surgery the week prior! Playing a man down the whole game on defence, the Herd were able to match their opponents score for score. Then, when they needed to seal the game, Julian Wytinck hit Anthony Dyck to do just that with just seconds remaining on the clock. Despite the loss, You Belicheck Yoself has rights to the catch of the year! Paddy’s Angels were coming off of an undefeated season and a thrilling overtime victory in their semi-final game, but it all came crashing down against the second seeded MonStars, who came out from hiding in the dark to show the Angels where nightmares come from. Matt Nikkel threw five touchdown passes, three to Cody Hunter and two to Andrew Gregoire in the rout. Paddy’s Angels will be checking under their beds for fear that the MonStars are not yet done with them. The trilogy game between Fall Ballers and The Tribe culminated in yet another one-point victory. These two teams are so evenly matched that in each of the last three games these teams have played, the final was decided by two points or less! The Tribe welcomed back Brayden Bernstein, who was coming off injury and he looked no worse for wear, scoring two touchdowns and playing some lock down defence. This game came down to the wire with The Tribe driving to win the game however a timely interception by Brandon Poulin was able to seal the victory for the Ballers. Not surprising that when two of the top defences in football collide, points would be hard to come by. 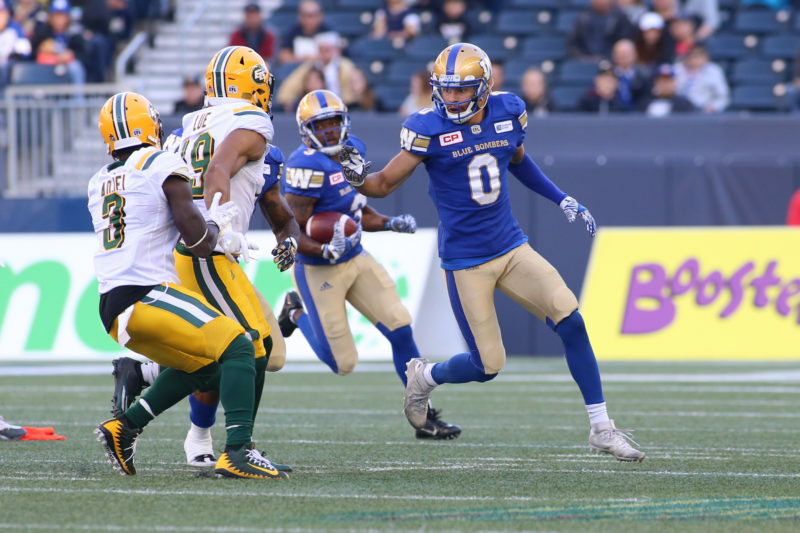 Neither team could jumpstart their respective offences, with the two teams combining for four interceptions, two sacks, and a lot of punting. The D went up early when Kelsey McKay hit Jorden Scholefield on a pinpoint pass, however that is all the offence The D could muster on this day. MVP Saliou Sako broke the game open late for C’Mon Man with an interception and then a touchdown on the ensuing drive which ultimately was the difference in this game. The top four teams in this division were tied with identical 3-2 records, so even though the bottom-seeded Average Sized Giants won the championship, there was little separating each of the teams. It was fitting that a division that was so closely contested during the regular season would come down to overtime to settle the championship. 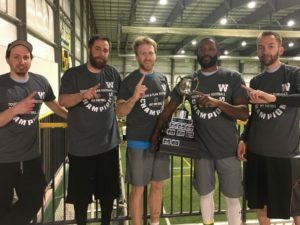 “1000 Career TD Pass” Club member Jean-Guy Mercier found Martial Desrosiers for the only convert in overtime to ensure this championship was anything but average. 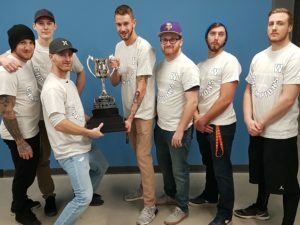 For the second straight season, Ballz Deep snuck into the playoffs via a tiebreaker on the last weekend and then proceeded to shock their division and go home as champions! Not unlike what we saw with most of the divisions this season, the top two teams were upset on the way to the championships. Ballz Deep was led by Tarik Tokar and Jon Selig both of whom scored 12 points and an interception. 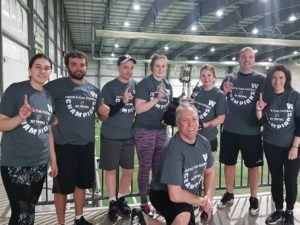 The Snow Mexicans countered with eight points and two sacks from David McGarey, but it was not enough to stop the championship repeat. The Dragins were one of the highest-scoring teams in the league and the offensive onslaught continued as they dropped 49 points on Knibb High. Chris Dobson set the all-time single-season scoring record with 135 points for the Dragins but was held to “only” 12 points in the final. While Knibb High was working on slowing down Chris, Rene Bosc was able to go off for four touchdowns and a convert. Former top-division quarterback Lionel Gauthier amped up his game this season and if he can continue with that level of play the sky is the limit for these Dragins. The Moose feed the Guardians a knuckle sandwich as yet another undefeated team went down in flames. Jason “please schedule the championship game late so I can watch the Black Panther movie” Gibbons threw for four touchdowns while Christian and Fritz Pacag racked up 12 points each on their home field. Vaughan Lloyd scored 12 for the Guardians, however it was not enough to overcome the curse of the No. 1 seed! The Free Agents showed up to their first game, met one another, then promptly went out and lost. That would be their only setback of the season and once this team gelled they worked their way to the top-seed. Tony Carvalho had a touchdown, two converts and an interception for the Free Agents who went down a score quickly but never looked back after the slow start. 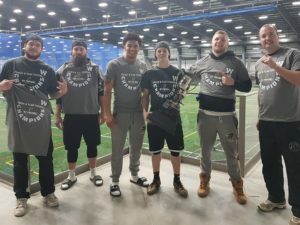 The Free Agents had such a good season that they have now branched off to form their own team in the hopes of a repeat championship in the Spring season. In yet another division in which the top two seeds didn’t survive the first round of the playoffs, the two bottom seeds faced off in what we thought would be a replay of their epic regular season game which saw Ten Toes Down stop Onslaught’s final drive at the goal line to win the game. This game, however, was not nearly as close as Kirk Pascal went off for 27 points and an interception while Brett Anderson threw for five touchdown passes and picked off a pass on defence. Ten Toes Down has now played in two seasons and has been victorious in both! 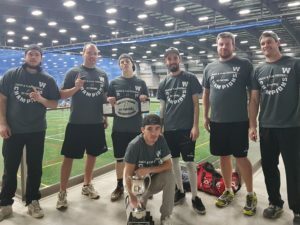 The Chuggernauts are quickly becoming one of the most-storied franchises in touch football history, winning their sixth championship title which puts them in some elite company. 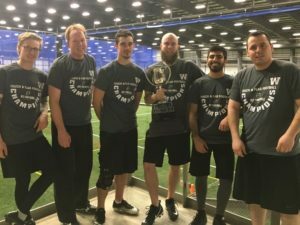 What makes the Chuggernauts one of the most-compelling franchises is not only their penchant for titles, but also their penchant for going winless the season after winning a championship. Will the curse be broken this time? We don’t believe so. All hail the forthcoming winless Chuggernauts’ spring season! 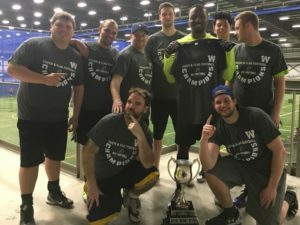 The story gets repeated: bottom seed gets into the playoffs via a tiebreaker on the last weekend of the season, gets hot and knocks off the top seeds on the way to an improbable championship win. Is it improbable now that 3rd and Long are the fourth team just this season to do so? Jordan Mirwaldt threw for four touchdowns, three to Mark Nassar, in the latest worst to first scenario! The VMC seniors Dante Bellisario showed why he one of the best up and coming players after he threw for three touchdowns and intercepted three passes in the final. 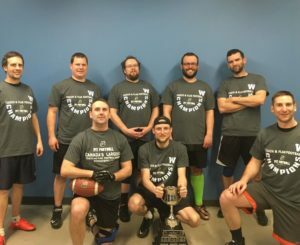 The VaudeVillians learned not to look past their opponents after they narrowly escaped their semi-final game with a one-point overtime win. 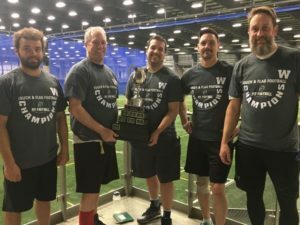 With the final victory, the VaudeVillians cap off a perfect season and became one of the few top seeds this season to have their names engraved on the championship trophy. Jayden Bannerman had three touchdowns for the VaudeVillians while Zachary Medal had four sacks. This well-rounded team will look for the three-peat in the Spring. 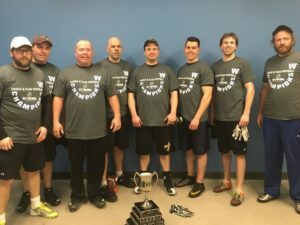 Another undefeated team had their season end in disappointment as the Usual Suspects saved their best game of the year for the championship final and knocked off the top team in Division 17. Game MVP Nathan Misir ran for a touchdown and threw for four more, including three to Drake Yaremko in the victory. Team Manitoba player Brett Zdebiak scored 13 for No Punt Intended, but this game provided further empirical evidence that being a top seed is a curse (or perhaps that there is so much parity in the league that anyone can win). But as superstitious athletes know, it’s truly “the curse of the No. 1 seed”. Oay Co needed a tiebreaker just to make the playoffs but once they were in they ran the table, finishing with a very impressive shootout victory. Royce Requeima scored 19 and added two sacks and an interception for D.T.F., but that impressive stat line was overshadowed by Oay Co’s Verinder Dandiala who scored 26 and had two interceptions in the victory. Oay Co capped a very successful sophomore season by not only winning the championship, but vanquishing D.T.F., the team who knocked Oay Co out of the playoffs in the fall. 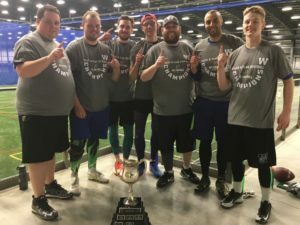 The North Free Agents pulled off the upset and defeated the top-seeded Dilligafs on the strength of MVP Jordan DeMerchant’s five touchdown passes — three to Arminder Warha, who had himself a great season and capped the night with his third championship crown! The Dilligafs are left to ponder a second straight championship loss after coming in as the No. 1 seed. A very successful season to be a free agent as both teams took home championship hardware. If you are looking to join a team, the Free Agents are currently the popular choice to register as a player! 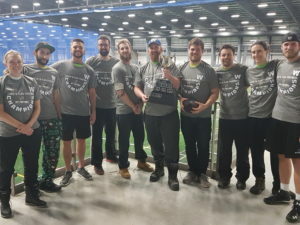 Back That Pass Up became the latest team to pull the worst to first in the Winter playoffs, first knocking off the TD Twisters in a high-scoring affair and then showed they can play some stout defence in a defensive battle versus Illegal Contact. Alex Henry led the Back That Pass Up defence with three sacks. 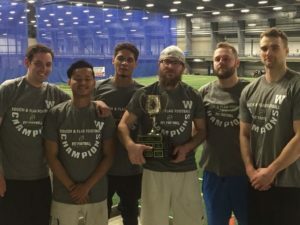 Illegal Contact only gave up a total of 22 points in the playoffs but remarkably that still wasn’t enough to secure the Division 20 championship. 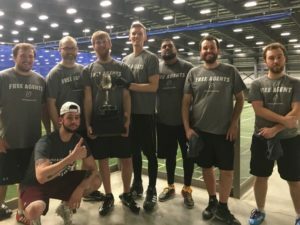 The SuperTroopers captured their first championship under their new name and logo as they defeated a veteran-laden PrimeTime team. 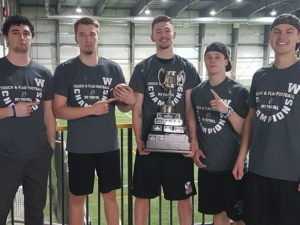 Newly-minted QB Derrick Hrabarchuk threw for three touchdowns, ran for one and picked off three balls while playing defence to take home game MVP honours and have his name engraved on one of the nicest trophies in rec sports! League MVP runner up Jason Cassie threw for two touchdowns as PrimeTime was defeated in prime time. 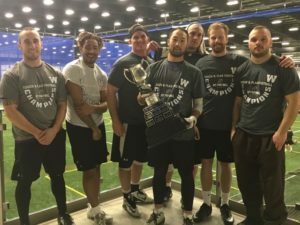 The former Maples Marauders faced off against the Burland Boys, who are a force in the Football Manitoba Flag football league. 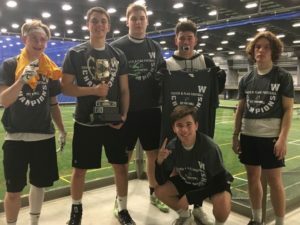 On this day the tackle alums knocked off the flag football players but give the Burland Boys – who were the youngest team in the league, with an average age of just 16 – a couple of years and they will be the team to beat! Maples Alumnus Matteo Urciuoli has himself a day with four interceptions and 18 points. In a heated battle between two up-and-coming rookie teams, Show Us Your TDs scored late in the game to take the closely-contested victory. Kevin Johnson scored 12 points and had an interception for the champs, while Colton Sobering put up identical numbers for the runners up. A great battle between teams that ideally will have a good rivalry for years to come. 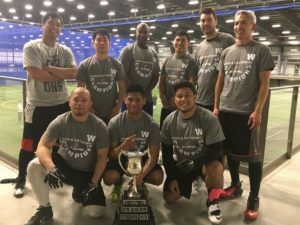 Athlete’s Foot repeated as champs, defeating newcomers GoldBone in large part due to Elijah Glor’s three-interception night. Justin Reid replied for GoldBone with two interceptions and twelve points. 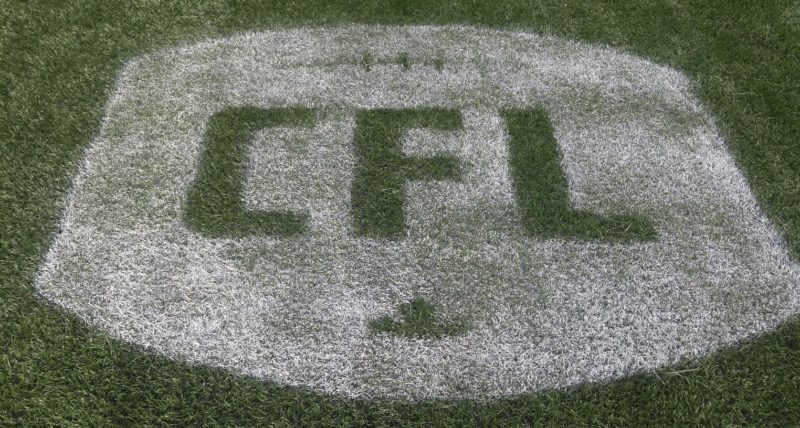 The Athlete’s Foot offence came alive after scoring just two offensive touchdowns all season. If you are going to put up your biggest offensive numbers of the season, the championship final is the best place to do it! 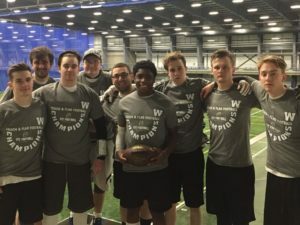 The PIT Football league is the official touch football league of the Winnipeg Blue Bombers. The PIT would like to thank the Winnipeg Football Club for helping grow the game of touch football in the province! 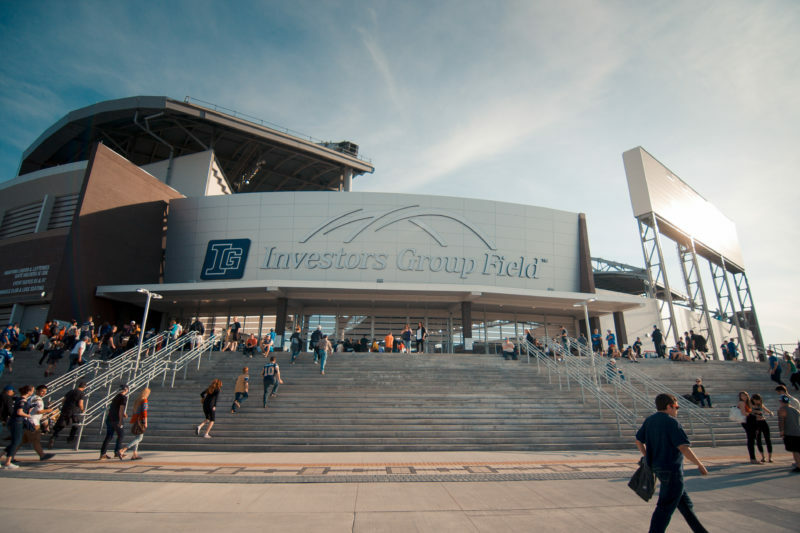 Spring registration for the indoor touch football league is now open. Registration information can be found here.